Description of Safety Management. Explanation. While conducting their business, organizations have an ethical responsibility to make a positive contribution to society. Safety is one important ethical issue. There are many definitions of Safety. A widely-accepted one is the freedom from the occurrence or risk of injury to, danger to, or loss of human life. Leading organizations will encompass mental, social, and spiritual risks humans face under a Health and/or Well-being portfolio. Safety concerns equally apply to the risk that physical assets such as property, structures, tools, equipment, vehicles encounter. There are also differing views about Safety as an entity. 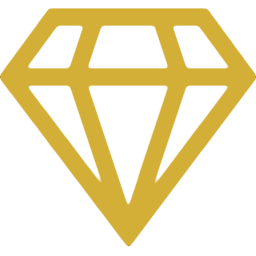 Some believe Safety is created like a product or service. Others think that Safety is more like air - omnipresent and subject to contamination if not carefully managed. A new view sees Safety as an emergent property of a complex adaptive system. Thinking about Safety has evolved over time. The evolution has paralleled how business and industry leaders thought about maximizing the value of the human workforce. Safety Management is the whole of conscious efforts to prevent accidents, failures, and other adverse consequences impacting employees, customers, shareholders, contractors, suppliers, and the general public. Safety management means adopting a systematic approach with a safety vision statement, goals, strategies, structure, policies, programs, rules, and procedures. All of the above efforts must align with the safety regulations, standards, and directives imposed by the government jurisdiction the organization comes under. For example, WorkSafeBC is such a government agency who acts as the safety regulator in the province of British Columbia, Canada. Workplaces exposed to significant safety risks such as energy, transportation, shipping, aviation, petroleum, healthcare, will typically need a more comprehensive Safety Management System (SMS) then regular office environments. 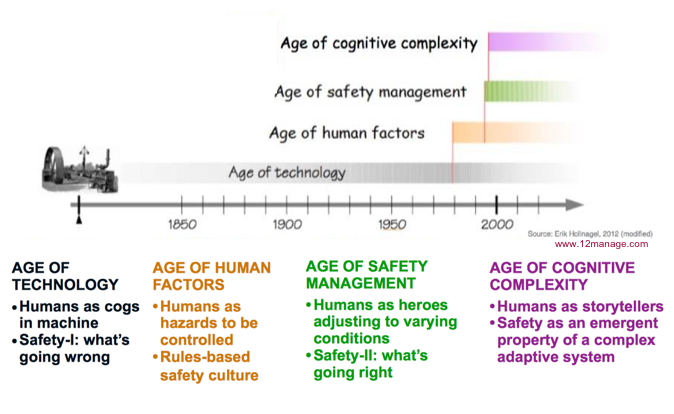 In 1998 Andrew Hale and Jan Hovden described the 3 ages in the development of safety thinking: Technology, Human Factors, and Safety Management. This evolutionary path could now be extended with a fourth age (Cognitive Complexity). It should come as no surprise the safety ages mirror the overall evolution of business practices. In the Age of Technology, Taylorism and Scientific Management treated humans as cogs in machines. People were seen as error prone and machines had to be guarded from workers to keep production lines running. The focus was on avoiding what goes wrong and keeping the number of adverse outcomes as low as possible. Recording lost-time frequency and severity became the statistical measures for Safety. Hollnagel coined this rather negative view of safety as Safety-I. Productivity soared but eventually peaked due to human limitations and imperfections ("Dirty Dozen"). The age of Human Factors marked the arrival of Systems Thinking with Peter Senges seminal book The Fifth Discipline. Humans were treated slightly more favourably, no longer as cogs but as hazards who could be controlled with rules, inspection, audits. Two nuclear power plant accidents (Three Mile Island and Chernobyl) placed more attention on the fallibility of humans. From the reports a new term was spawn: 'Safety Culture'. This is the era when businesses engaged systems thinking from an engineering perspective. BPR popularized the mantra faster, better, cheaper and applied linear reductionism to break down a system into parts: people, process, and technology. Hollnagel questioned why so much time and money was being spent on accident investigations. To be more proactive, he introduced the concept of Safety-II and learning from what is going right, which happens most of the time. Acknowledgement was given that workers cant control everything and often a workaround is required to get the job done. So the idea of 'Performance Variability' was born; a human is not a hazard but a hero who could vary performance in order to adjust to changing conditions in the work environment. The latest age once again shift the thinking on safety as new research findings in cognitive and complexity sciences are applied to make sense of safety. All organizations are viewed as complex adaptive systems (CAS). Safety is defined as an emergent property of a CAS. Humans do not create Safety; they create the conditions that enable safety to emerge. For example, safety rules are useful because they create the conditions for safety to emerge. However, if more and more rules are added on, a worker goes into cognitive overload. What emerges is Danger in the form of pressure, frustration, distraction. And if a complexity phenomenon called a tipping point is reached, an unintended negative consequence (called "Failure") could unexpectedly happen. Another insight in cognitive science destroys the myth that a human brain functions as a computer, a logical information-processing machine. The brains strength isnt storing and retrieving information but recognizing patterns. Humans are Homo Narrans, i.e., natural storytellers. When telling safety stories about past events, a worker will share feelings and emotions that direct questions would/could not reveal. Stories are also better to describe complex situations since they can provide context. When analyzing Safety-I + Safety-II type stories as a collection, the brain is able to recognize patterns of behaviour which might explain why people behave the way they do. These patterns may include team rituals, crew taboos, unwritten rules, sacred cows, and tribal codes. In essence, stories and their underlying patterns generate a picture of the organizations safety culture. Please note that despite of above approximate timeline, each age is not necessarily supplanted by the succeeding age. Examples of each age can be found in most organizations around the world. Despite evolutionary advances to improve safety, the current dominant paradigm remains Safety-I. Most Safety Regulators carry out their duties through a Safety-I lens. It explains why accident investigations favour RCA methods and end up attaching blame to workers. Management to look good in the eyes of the Safety Regulator (and avoid punishment) will pile on new or revised safety rules onto the backs of fatigued workers and add to the compliance inspection checklists of overburdened supervisors. Erik Hollnagel (2014). Safety-I and Safety-II. Jan B. van Erp (2002). Safety culture and the accident at Three Mile Island (IAEA-CN--97). International Atomic Energy Agency (IAEA). Eddie Harmon-Jones (2009). Unplugging the Computer Metaphor. Psychology Today. This ends our Safety Management summary and forum.